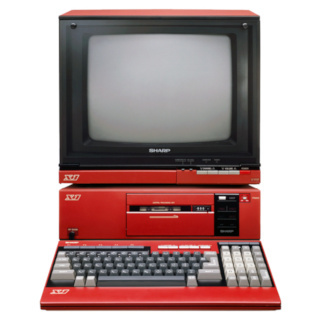 So, a while ago I saw this picture of a classic SHARP X1 desktop computer (16bit era computer using a Z80 cpu, storage was a cassette tape!) in iconic red colour, and I decided that the natural thing to do would be to turn it into a Winamp skin. And, here is what I have so far. It’s just a main window, and it’s not quite complete, but you can get a good idea of the look that I’m going for. Fonts are accurate! I based the bitmap fonts for time display and title display off the actual font that this system uses in its BASIC text mode thanks to a YouTube video where someone dumped the character ROM. 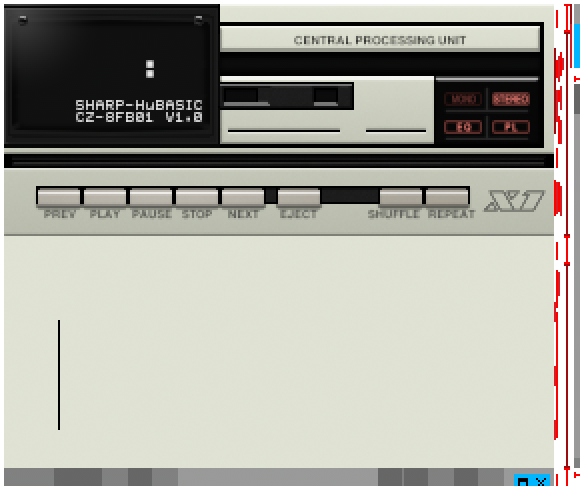 The song title, volume/balance bars, monoster are designed based on the appearance of the tape deck on the front panel. Still todo: add a “reset button” to the bitrate display so it looks more like a tape counter. Cbuttons are styled to look similar to the TV control buttons seen on the keyboard. This is still a WIP - I haven’t gotten the final shape or shading quite right yet, and there’s no pressed states yet. I’ll add the winshade/minimize/close buttons… later. You can download this WIP skin or preview it in Webamp. I’ll try to post updates now and then here, but you can also follow me @kepstin@glitch.social where I sometimes post minor updates as well. There used to be more stuff, but hey, links die over the years. Man, that's awesome, really looking forward to see it complete! Fun fact, the SHARP X1 series was also available in off-white. So, a possible colour variation? IMO, the red looks better and will be the main version. Only other change here is that I tweaked the button spacing and shadows a little. Haven't had time to work on this recently. If you know me, you'd know I love color themes, so I obviously like it, looks nice. Red, white and black would feel like all bases covered (but I know that's too much to ask heh).